The benefits of yoga for athletes is something that has been widely studied. I am an avid tennis player and I will never forget the moment when I was watching the tennis channel and they put up a question onto the screen, "what is the single most beneficial thing you can do for your tennis game," yoga. As it turns out yoga makes you incredibly quick on your feet. Stretching out those muscles causes you to have the ability to get balls and move in ways you could not do otherwise. I decided to take them up on it and start doing yoga. Check out this video below. I can't tell you the transformation in my game as far as my agility and quickness went. I began to get balls that I could never have gotten to in the past. I simply could not believe how much improvement I got after I adopted a regular at-home yoga practice. Check out these poses for your tennis game below. I purchased several DVD's on Amazon to help me make sure I was doing the poses correctly and also assist me in alternative poses that I was not able to do initially. This DVD really changed my life in so many ways, it was called Yin/Yang Yoga. You can buy it here at Amazon. Yin Yang Yoga is long hold yoga practices. Basically, you decided where your body needs the most help and then you go after it with these long hold poses. The goal is to stay in these poses at least 5 minutes. Believe me, that isn't easy especially when you are very tight in certain areas. I had to work up to it starting out and a minute and over a period of months finally doing up to 5 minutes in each of the poses. This is the DVD I used and loved it. The whole experience was surprising and initially, I went into this hoping for an improvement in my tennis game, but what I got was so much more. I found that being in these poses brought up a lot of emotions. Often times I would break out in sobs and have no idea why or where they were coming from. All I know is with each emotional outburst came more and more flexibility. Pretty soon I began to realize that I was holding old pain and feelings in certain tight areas of my body. Everyone is different, everyone holds in different places, but we all hold. Often times the holding patterns are related to our life experiences. I had a good friend who I invited to start joining me in my Yin Yang Yoga at my house. We quickly discovered that she was extremely tight in her hips. Knowing her as I do, I knew she could not have children and that she had suffered a lot of female health issues. I got her into a pose that really gets deep into your hips, we stayed in it for 5 minutes when she broke out into sobbing. I encouraged her to stay in the pose and allow the emotions to fully release. Coming out of the pose too soon will stop the reaction and you could lose the benefits of the release. For me, I stored my emotions in the heart center. Having gone through some difficult emotional times in my life that literally broke my heart, it wasn't a surprise that most of my release came in wheel or any poses that opened up that area. We seem to know where we store our stuff, it is something that is very intuitive I could pretty much ask anyone where they think they are holding and they would know. It is not difficult to feel where the trouble areas are. Releasing that stored up emotions is one of the best things you can do for your health. Releases are referred to in yoga as a gift. We can't will them to happen, they just happen when they are ready to happen. Often times after we experience a release and the cleansing benefits we received from it, we start to go into our practice hoping for more of them. This is a mistake. Yoga is a spiritual experience and very transformational. Allowing it to unfold in its own time is crucial. If anyone has had any spiritual experiences while meditating, they will understand this concept as it is much the same. As we become older, taking falls and losing our balance becomes an issue. Yoga can really help us with that problem. When we lose our flexibility we become very blocky so it is easy to go down like a pillar and lose your balance. Once you regain that flexibility you are pliable and bendable and not as susceptible to taking a fall and being top heavy if you know what I mean. Losing our flexibility can make us feel old and not ourselves. By regaining control of our bodies we begin to feel young again. We start to have a new perspective on life and more control of how we chose to age. Check out the benefits of yoga as we age in this article. This major muscle holds upper spine to lower spine, it's what connets us. A number of years ago my son dated a girl who was a yoga instructor, it was she who got me involved in yoga, for this, I will always be grateful to her. I started going to a few classes and I purchased some very good descriptive books that gave alternative poses for the ones you couldn't quite get into. There were a lot of those for me because my body was extremely tight and opening it up would not be easy. Little by little I had small gains and I became more and more excited about yoga. These are the books I used and there is one for every part of the body. 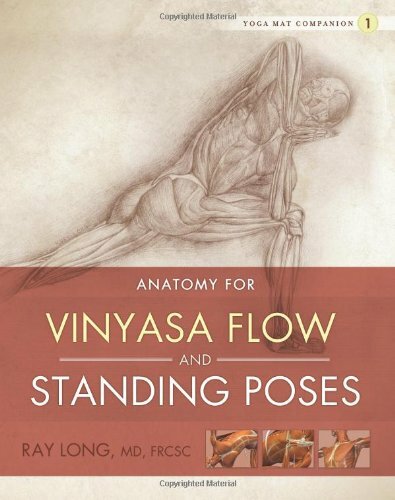 Very good reference books for alternative poses too. This is an amazing DVD that teaches long hold poses or Yin Yoga. Great for working at opening up your body. One day I was doing my practice and I decided to press up into the wheel pose. I am very inflexible in my back and my quads and psoas are extremely tight. As soon as I went up into the pose I felt a sort of release. At first, I was afraid I pulled something, but what followed let me know that was not the case. A sudden burst of emotion shot through me that stunned me. I dropped down out of the pose and rolled over on my mat and preceded to sob like a baby for what seemed like minutes. It wasn't a normal cry, it was an outburst that left my lower lip folded down and quivering like a small child. It was a sort of recognition or re-remembering of what it was like to cry that way when I was a child. I would learn later that the reason it felt that way is it was in a sense a child crying, my inner child. In fact, many of the emotional releases are linked to childhood and that is why we cry the way we do when we have them. It isn't important in yoga to remember the wounding and go over it, what is important is to feel the emotion as it washes through you and then release it. It is one of the best feelings in the world, a real inner cleansing. I continued on with my home practice of yoga and experienced many more releases and they were all similar in experience. I was quick to learn that you can't demand one or bring one on, like all spiritual experiences they are involuntary and come when you are least expecting them. I try not to look for a reason for them and have found it is best to let it be what it is. I think most of us think that our bodies are tight because of sports, old injuries, or just plain aging. I thought that too until I began to gain a lot more amount of flexibility after the emotional releases. There was no mistaking that old stored painful memories were making my body tight and rigid and releasing them was making it flexible. You can see here what a massive muscle the psoas is. Have you ever heard anyone say, "I've had a belly full of that?" That would be their psoas talking, it's the one place that is a real dumping ground for emotions. The tightening of your gut, the pulling in of your shoulders, and the sinking of your heart are all triggered by the stressful events in your life. An argument, a close call on the drive to work, and ongoing stress all affect the psoas. The psoas runs from the thigh bone through the whole length of the belly and is the major flexor of the hip, it is the psoas that lifts the leg. It is where your upper spine meets your lower spine. It originates on the lowest thoracic vertebra and each of the five lumbar vertebrae of the lower back and extends down through the pelvis to attach on the inside of the upper femur. It passes through three major joints, hip socket, sacrum, and pelvis. If the psoas isn't healthy you can see why this could cause some major problems in your body. When you are under constant stress or you are engaged in a repetitive activity, the range of motion in the hip sockets is limited. If your psoas is asymmetrical, that is, one side is more contracted than the other, the result is a tilted pelvis and one leg being shorter than the other. Once this imbalance occurs walking is no longer carried easily through the bones and the psoas now is spending its time trying to stabilize the pelvis rather than moving freely in its hip-flexing function. When the psoas is healthy the weight is borne through the bones, and walking comes from the solar plexus instead of the knee or hip joint. 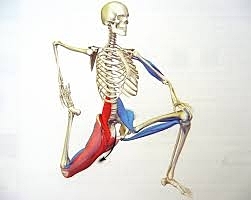 If your psoas is your problem you will begin having trouble through its attachments to other important muscles. the diaphragm, the trapezius, and the quadratus lumborum, which also attach on this vertebra. Many people think that the best thing to do is embark on a rigorous exercise program to strengthen the psoas when in fact, what it really needs is some rest. Systematic rest and relaxation practice are what the psoas will respond best to. Use a pillow to keep your back flat and relaxed. Allow the knees to fall together. Regular corpse pose will tug at your hip flexors so placing a rolled towel or use of a foam roller behind your knees is the best way to take the pressure off the psoas. Another option is to bend your knees and let them fall against each other with your feet placed on the floor. This position will relax you and allow the breath to flow effortlessly, smoothly, and evenly. Now you can begin to understand that psoas is an emotional barometer that is tightened by stress and released by relaxation. Again, make sure your back remains firmly on the ground. Next, while lying on your back draw one knee toward your pelvis. Make sure you do not allow your lower back to arch up from the floor. Stabilize the pelvis and extend the leg to loosen the psoas. If you allow your pelvis to tilt, the psoas doesn't lengthen or release. but pulls the lumbar spine forward arching the lower back. To keep the pelvis aligned, draw the knee of the bent leg toward your abdomen. Stay in this pose for 2-3 minutes and focus on your breath as you notice your body relaxing and releasing tension. Start on your hands and knees. Step your foot up and go between your hands so your knee is directly over your ankle, and the thigh and shin are at right angles. You can leave the extended leg back with the top of the foot facing down. Breath into your pelvic floor between the tailbone and pubic bone. Come up onto your knee placing your hands folded behind your back. Stretch the other knee back as far as you can with the top of the foot facing the floor. Relax the psoas and engage the abdominal muscles to stack the torso over the pelvis, press your hands down onto your thighs as you draw the shoulders down and away from your ears. Hold this pose for 2-3 minutes and then reposition your arms up in the air for the second variation of the pose and hold this for another 2-3 minutes. Finally, go into the child's pose, breathing into your belly and hip joints for 2-3 minutes. Then repeat the whole sequence on the other side. Whenever you sit in your yoga poses be sure your hips are always slightly higher than your knee joint. Otherwise, the psoas will be working too hard to keep you upright. The use of a small prop under your behind and accomplish this. Our hips have long been known as a junk drawer for our emotional storage. Whenever we are in a state of stress our body recognizes our tight hip flexors and suppressed emotions, to be our natural state of being. This pose can be really affective at clearing out stored emotional baggage. A tight psoas can cause shortness of breath and chest breathing which further adds to our stress. It has long attributed to low back and pelvic pain. By nature our psoas pulls our body together when we are under stress to protect itself by forming a fetal position, creating a sense of safety and protection of all our vulnerable parts. After traumatic experiences have occurred just telling our bodies to relax isn't enough, some of the strongest muscles in our bodies are located in this region. Long hold yoga poses that access the psoas is very effective at removing traumas that have been stored there in this life and past lives. Many people have experienced emotional releases during these types of long-held yoga poses. Persistent practice will bring releases and relief to tight areas of your body. This is the beauty of an at home practice. We are each different and unique where we hold our emotions so an at home practice lets you tailor your yoga practice to your own personal needs. In other words, why spend time in poses that you don't need when there are so many others you do need. Science is now gaining respect and understanding of forms of art like Yoga, Trauma Release Exercise (TRE), Fascia Unwinding, Hands on Healing, Meditation, Visualization techniques, are all being used as a means for releasing emotions held in the body. These practices have been used to improve the mental and physical health of patients. Practices such as rocking back and forth, constructive rest position, and flexing and pointing the feet, shaking and rotating the legs, etc. It is not uncommon in poses that are opening the hips bring on bursts of emotions. Don't be surprised if you find yourself sobbing for no apparent reason. By activating the psoas you can actually release the trauma by stimulating the tissue/cell memories that are stored there. By working on your tight psoas you can benefit by freeing up your hips and releasing emotions that are held there. Things like relief in back pain, unstable posture, support for sitting for longer times, stronger core muscles, relaxed breathing, stress-free life, healthy kidneys, good sexual life, etc. Check out this video below. Here are some stretches you can do to loosen up your hips and get at your psoas muscle.